You know the feeling: A day or two after a tough workout, your entire body feels like it's being eaten alive by tiny, rabid beavers, painstakingly gnawing your muscles away from your bones. Sitting down on the toilet has never been so excruciating. You can only wear button-down shirts because lifting your arms over your head just isn't going to happen. What you're experiencing is called DOMS, or delayed onset muscle soreness. For such a benign-sounding clinical name, it's a special type of torture. One that may make you want to swear off exercise for life. DOMS, while seriously unpleasant, is completely normal, and also manageable. You just need to know how to manage it. Exercise is a voluntary form of stress. When your body's not used to regular exercise, or if you suddenly switch up your workout routine after weeks or months of doing the same old thing, you're forcing your muscle fibers to work in ways they're not used to working. This unexpected stress causes microscopic tears to your tissue, which ultimately leads to the inflammation and pain you now know as DOMS. That all sounds terrible, right? Actually, it's not as bad as you may think (aside from the pain, of course). You see, muscle fibers that are challenged and stretched beyond their limits are muscle fibers primed to grow and get stronger. DOMS is an indicator of exercise-induced muscle damage (EIMD), which, in turn, is associated with the strengthening of muscle tissue and hypertrophy. In layman's terms, that soreness you feel after a workout is a pretty good indicator that your muscle fibers are getting stronger and more efficient so that the next time you ask them to do the same workout, they'll be better prepared for the stress. The cliche of "no pain, no gain" is, sadly, mostly true when it comes to working out. While there are ways to limit and reduce the pain associated with DOMS, there's no quick fix to make it simply go away. If you want to see steady improvements in the gym, you're going to have to resign yourself to the occasional discomfort of DOMS. Sorry. That said, the treatments that appear to do the most good are those that encourage blood flow to the worked muscle, helping deliver key nutrients to the damaged tissue while removing waste products from the area. A little post-workout soreness is a good thing, but a lot of soreness isn’t necessarily better, and in some cases, it’s straight-up bad. DOMS shouldn't leave you laid up in bed for a week. It shouldn't prevent you from heading back to the gym for another workout. And it certainly shouldn't send you to the hospital for rhabdomyolysis, a serious condition that can occur when muscle tissue has been damaged excessively. The best way to deal with post-workout soreness is to prevent excessive soreness from taking place. This means you should ease your way into new workouts, and go light when you alter your usual routine. For instance, if you haven’t been to the gym consistently since college, don’t start with the same routine you followed when you used to hit the gym every day. Go light. Keep your workouts short. Try a lower-impact, moderate-intensity routine, rather than a high-impact, high-intensity routine. These strategies won't completely prevent soreness from taking place, but they can limit the damage, enabling you to gradually and consistently work up to a more challenging routine. I hope you like tight clothes, because squeezing yourself like a sausage into compression garments after a workout is one of the most legitimate ways to modestly reduce the effects of DOMS: A 2014 analysis of 12 different studies found that wearing compression garments after a workout has a moderate effect on reducing DOMS. Now, don't expect any miracles. 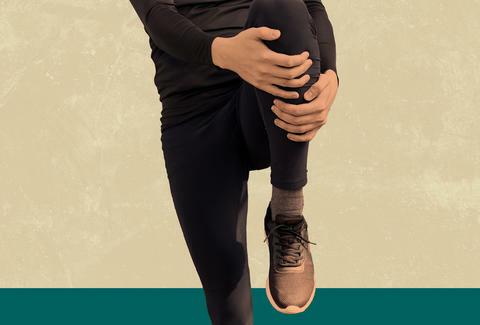 The pain will still be there, but compression garments can help limit the length of time you experience DOMS. Just make sure you're wearing recovery garments on the muscles you actually worked. Throwing on a compression shirt after leg day isn't going to do you a damn bit of good, obviously. Like compression garments, foam rolling and massage therapy are not magic bullets for handling DOMS, but there's some evidence that both can help. For instance, one study found that 20 minutes of foam rolling performed immediately after a workout, then again at 24- and 48-hour intervals, resulted in a reduction of pain at the sites of the worked muscles, as well as improvement in athletic performance during follow-up workouts. Likewise, a separate study found that a post-workout therapeutic massage had a significant effect on reducing soreness while simultaneously improving gait. That said, the effects may be limited -- pain-reducing benefits can peak at 20 minutes post-massage before DOMS works its way back to full strength. If you ask me, you're better off saving all that money on massage and investing in a $12 foam roller instead. The same study that analyzed the short-term benefits of post-workout massages also found that active exercise resulted in a similar, short-term relief of DOMS. So even though all you want to do after a tough workout is lie on the couch and cry, that pain and stiffness you're feeling may actually ease up if you force yourself to get moving. You don't need to go all-out -- go for a walk, take a 30-minute bike ride, or sign up for a yoga class. In addition to some temporary pain relief, this type of recovery workout can help solidify a consistent workout routine. Never underestimate the power of ibuprofen. It won't do a darn thing to shorten your walk through DOMS hell, but it can help make you feel a little better through the process. Just follow dosing instructions, and you'll be back to pumping iron in no time. Laura Williams is an exercise physiologist and fitness writer whose regular exercise routine still doesn’t exempt her from the torture of DOMS. It’s a real bummer. Check out her book, Partner Workouts, on Amazon and connect on Twitter @girlsgonesporty.